Your NYACP had a very busy week in Albany. Meetings between our lobbying staff/advocacy intern and Legislators were held to express items of importance in the State budget. Issues supported include proposed fee for service increases for E & M primary care codes under Medicaid, support for continued DANY funding, support for Tobacco 21 and further prohibitions on e-cigarettes. Concerns regarding the proposal for recreational (adult) use of marijuana and concern over proposed bills to allow children to enter public schools without proper immunizations were also covered. A meeting hosted by the Chapter with other interested specialty societies, MSSNY and representatives of the New York State Department of Health was held to discuss the Electronic Death Registry System, its operation, access, challenges in use and the benefits/value of adequate data collection. On January 16th 2019, Governor Andrew Cuomo unveiled his 2019-2020 executive budget of $175 billion. $74 billion for healthcare spending is proposed, with another $5.36 billion for mental hygiene. Legislation to raise the minimum sales age for tobacco and E-cigarette products from 18 to 21 and end their sale in pharmacies. Clarify the Department of Health’s authority to ban the sale of certain flavored E-cigarette liquids. Introduce a tax on E-cigarettes and require that they be sold only through licensed retailers. Legalizing recreational use of marijuana for adults aged 21 and above. This could bring $300 million per year in tax revenue, once established. Doctors Across New York and other Workforce programs continued at previously funded levels – DANY provides funding of $120,000 for loan repayment or practice start up costs for physicians looking to practice in New York State communities of need for a minimum of 3 years.Other workforce programs funded include continuation of Empire Clinical Research Investigators Program, AHEC (pipeline training/education) the ambulatory care training program, workforce studies, and diversity in medicine as well as rural access development. The medical liability excess fund is also continued. Building on the work of the Task Force, the Governor will charge NY agencies with partnering with communities in innovative public health approaches, healthcare systems, cultural competence in prevention programming, comprehensive crisis care, and surveillance data. 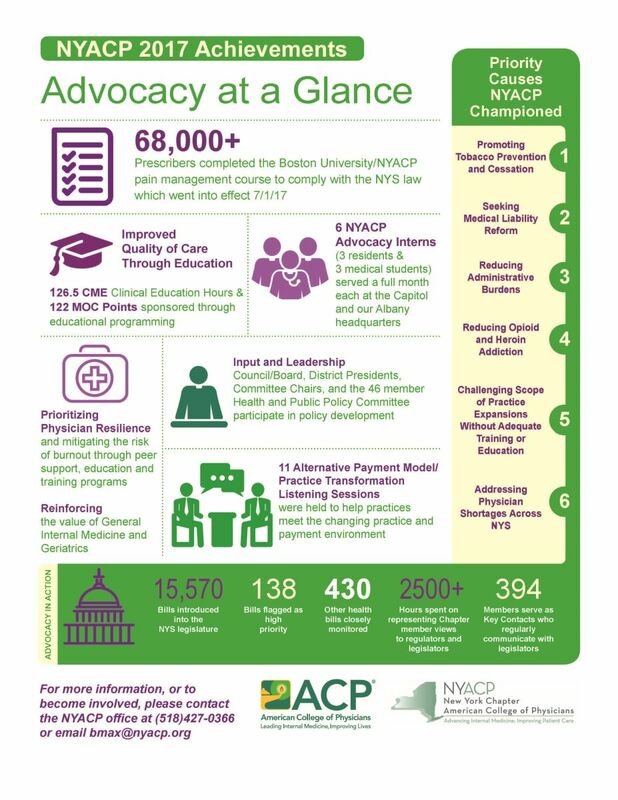 To read more of NYACP's advocacy achievements in 2017, please view this infographic. On November 28th, Governor Cuomo signed S7537/A1044 which amends the Public Health Law to allow a pharmacy, upon the patient’s request, to transfer an e-prescription to another pharmacy effective March 1, 2017. This was a legislative priority for NYACP having heard from many members of the challenges faced as e-prescribing has been implemented – and this bill resolves many of those concerns. Support from other professional medical societies helped to emphasize the concerns across all medical specialties. This new law eliminates much waste on both patients and our members’ time when they had to re-issue scripts for reasons such as lack of supply in stock at time of fill, the patient for convenience stops at a different pharmacy or the patient has found another pharmacy to issue the drug at a cheaper price. Governor Cuomo announced on December 1st a series of new initiatives in the fight against AIDS – building on the state’s blueprint to end the epidemic by 2020. Earlier in the week, the Governor signed comprehensive legislation to eliminate barriers to HIV testing and other sexually transmitted infections, increase access to prevention and treatment, and expand research capabilities. Governor Cuomo also called on the federal government to authorize $45 million in Medicaid matching funds for critical programs supporting the battle against AIDS. On November 14, Governor Andrew Cuomo signed into law S.4721A/A.6983A , which directs the Commissioner of Health and Superintendent of Financial Services to establish a standard prior authorization request for utilization review of prescription drug coverage. The law does not impose additional burdens on the Department of Health to create new standards but instead utilizes existing standards created by the National Council for Prescription Drug Programs (NCPDP). This expands the use of standardized prior authorization processes across all payers, having clear implications for improved efficiency and enhanced patient outcomes. The law takes effect immediately. This was a legislative priority for NYACP. The Chapter, working with the Medical Society of the State of New York (MSSNY), drafted this legislation with the Senate and Assembly Legislative sponsors, and continued advocacy until it was signed into law.